You're looking at a proof of concept photo. 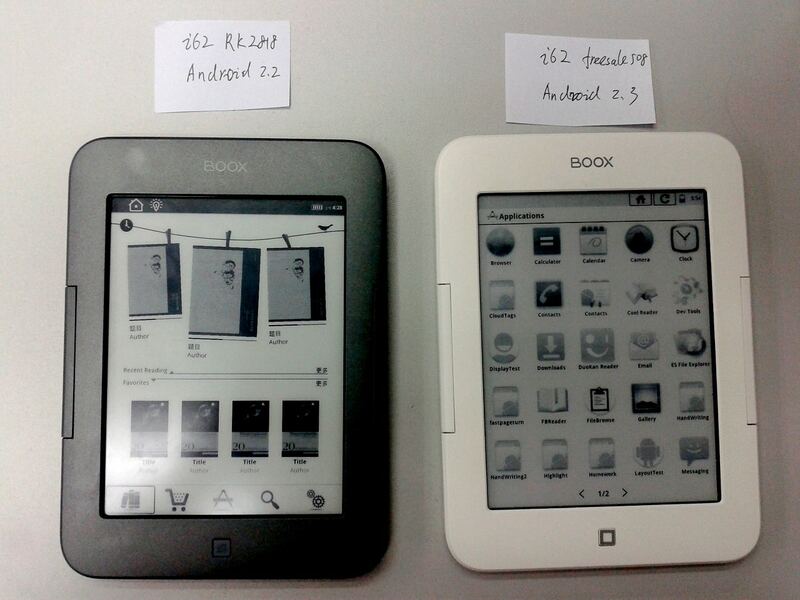 It shows the Boox i62, one of Chinese ereader maker Onyx's newer ereaders, and if the Post-it notes are to be believed they are running Android 2.2 and Android 2.3. Now, this is the i62, not the i62HD Firefly. That means this ereader doesn't have the high res screen and frontlight which is found on the latest ereaders like the Kindle Paperwhite, Kobo Glo, Cybook Odyssey HD, and more. But the i62 shown above is a close relative of the i62HD Firefly. That means it shouldn't be difficult for Onyx to release another firmware which runs on the newer device (fingers crossed). I got the photo via Booxtor. He's an Onyx reseller, and he runs the webstore eReader-store.de. All he got from Onyx was the one photo, and they wouldn't tell him when the Android firmware would be released to users. But it is still a good sign that we might see it one day and I will finally get the Android tablet with E-ink screen I always wanted. It would also close the last open door for Sony to sneak back into relevance, no? I hope they do release it: with at least Android 2.3. They could really clean up if they went the route Kobo did with the Arc: Android tablet with their stuff as a widget and app. Too bad Kobo didn’t do that with its own Mini and Glo! The funny thing is, I still hold faint hope that Sony will wise up and do the T3 right. Failing that, I hope the Nook Glolight HD gets hacked fast. We likely won’t see that until next spring. At this point they have to. I thought their timing decision was a bad idea when I spoke to the CEO a few weeks back but I never expected it to be a mistake of this magnitude. Now everyone but B&N and Sony is using the new HD E-ink screen. When a major player like B&N gets outdone by tiny companies like Bookeen and Onyx it is difficult to describe the magnitude of the error. Just how big of an error it proves to be we’ll know by January at the latest. I’m thinking we’ll be hearing once more about eink Nooks “Underperforming”. You can keep calling it an error… but the Nook’s are available everywhere now and the Kindle’s aren’t even available on Amazon’s own site. It sounds like Best Buy won’t be getting any Paperwhite stock until after black friday. Those other brands are equally tough to find in the US. The new screen may get good reviews and buzz. But being able to supply an actual product, to a large number of consumers, sometimes matters more. Sony will be the first to launch a new color e-ink HD eReader with frontlight and high speed browser that can play videos that rivals LCDs. If that time comes, then Sony will become a relevant player again in this market. Will you be able to install android apps on it? I would hope so. Otherwise it won’t be worth doing. Hmmmmmm… It could be my switch to Onix again. I had the old Boox 60 (or something like that) but I got frustrated with battery life, I’m a heavy reader and it didn’t last more than three days, I could drain the battery on a day and half of heavy (for me) reading. But the HD screen on an Android device, with buttons in both sides for page turning, being able to install the Mantano app for reading, back again with audiobooks to improve my english, it has two points over my Nook ST, provided the battery life is good enough. That won’t happen for me until an e-ink device maker licenses a rss reader like gReader pro or justreader pro, and then properly engineers the device to use one those applications. I can understand your inspiration guys. Well, it has no HD screen, of course, but the usage scenarios are in any case not so rich as you can imagine. I installed several e-book Apps and can read a number of books parallel without fileformat restrictions, in any font-type I like and with very fine formatting settings. And that is the limit, where the benefit ends. You cannot even read PDFs comfortably, not to mention “dynamic” browsing. I would suggest a bigger screen (like Kindle DX) would make an E-Ink Android device (as a “static” reader much more useful. My T1 is a bit more useful, since it has audio, but even if all I could do is open any ebook format from any ebookstore, that alone justifies getting the hardware. Especially with frontlighting and xga screen. Concur. I have ezpdf and dropbox installed on my rooted nook. Issallright, but the small screen really limits the potential. Need a 9.7″ screen at least.